Tug of War was released to celebrate and coincide with Slinkachu's solo exhibition at Christie’s annual art fair Multiplied, at their South Kensington gallery. A special £10 GBP unsigned and unnumbered edition based on Tug of War was released simultaneously, printed on A3 newsprint for sale only from 17 – 20 October at Christie’s in South Kensington and Andipa Gallery, subject to availability. 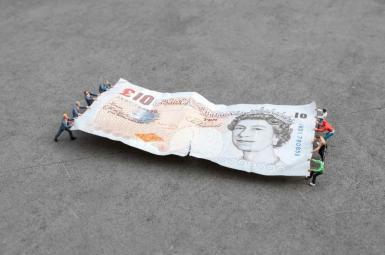 Tug of War comments on the age-old debate concerning the distribution of wealth amongst society. By having a ‘dropped’ £10 note the subject of a battle, two sides of society lock forces to attempt to gain the valued prize; a value which has a very different and, equally, relevant meaning to The Elite and to The People.